Elaborating on the previous comments. 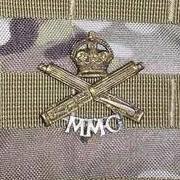 The Motor Machine Gun Service had planned to form 40 MMG batteries, but this was cancelled when the MGC took them over. Over the summer of 1915 the MMGS had recruited heavily for these planned batteries, but most of the personnel from August onwards started forming armoured vehicle units (the earliest predating the MGC). Once the army inherited the RNAS cars they began forming L.A.B units (four cars) - these were mostly later combined or upsized to 8 car L.A.M.B units due to having a more effective fighting strength and more economical (in terms of officers and mechanical support). From December 1915 on MMGS recruits in the main ended up going direct to Heavy Branch. Certainly from a strategy point of view the resources shifted into tanks as these were seen as a "war winner". In the first two weeks of November 1916 five MMG batteries were disbanded and research shows most of the personnel transferred directly to Heavy Branch - in what was obviously a planned move - and likely as a result of the tank action at Flers. By spring 1917 there were only three L.A.B units left in France and all of those moved to Mesopotamia. It's interesting to read the war diaries which show what these units were actually doing. For sure the MMG units were still playing an active roll (bearing in mind the motorcycles were primarily intended as a means of transport to move the guns where they were needed - and the guns dismounted from the bikes for use) the two main activities were extreme range suppressing fire with pre planned fire plans (using the road network behind the allied lines) and as mobile anti aircraft batteries. The small armoured car units were obviously struggling with the conditions - again the war diaries reveal constant mechanical issues (cars out of action for service and repair), issues with road conditions ect . Also shows up constant modifications and increased armouring required due to conditions armoured piercing bullets - these all increased weight to the point the cars were at their limit (mechanically) and even more prone to bogging down. So there were sound reasons for pulling them out and sending them to the middle east where they made much more contribution. It's interesting to see photos of the same cars later in Mesopotamia they removed a lot of the modifications to get the weight back down. Another interesting comparison - looking at the relative battery strengths (MMG battery, L.A.B and L.A.M.B units) shows up the manpower and technical support (and cost) required to put each gun in the field. The motorcycle batteries were more or less self sufficient in mechanical/technical support, and though the armoured car units also had their own mobile workshops they were much more dependent on central "depot" workshops for repairs/overhauls. I recall now the source of the quotation about the Vickers orders: the taped recollections of Brig. Gen. Raymond Brutinel, which can be read here. The power of inertia displayed by the Higher Command regarding machine guns, grenades, munitions and so on, paralysed the British Army for some time. Here is a first anecdote which illustrates this senseless attitude: on the 4th of February 1915 the King inspected the 1st Canadian Division mustered on Salisbury Plains. The Machine Gun Motor Brigade had been formed on three lines. The Armoured trucks and officers' cars - the ammunition trucks, the repair shops - and other auxiliary cars. In front of each armoured truck stood the Officer in Command, the driver and the two No.1 machine gunners. In the truck crouching behind the raised armoured panels were the men completing the crews. The King was interested by this unusual outfit and dismounting his charger, walked to the first armoured truck; he looked at it and fingered the front armour, then the armour of the side panels, and jumped lightly on a wheel to have a look inside the truck. He was suddenly confronted with the men completing the crews, who rose hastily to attention. The surprise was great on both sides but His Majesty seemed delighted with the incident and asked questions regarding the number of rounds carried, and so on. While awaiting his charger, the King said to Lord Kitchener : "This unit should be very useful I think." Much to my dismay, Lord Kitchener replied: "I don't think so, Sir, it would unbalance the fire power of a division." Lieut. General Alderson, then commanding the Canadian Expeditionary Forces, was near me and he heard the brief dialogue. After the inspection he told me gravely: "I am afraid Lord Kitchener is right." Here is a second anecdote, in confirmation as it were, of the earlier indictment. I was very anxious to secure Vickers machine guns for the Motor Brigade and if possible, for the Canadian Contingent, but I feared that the Vickers Works might be swamped by all kinds of orders. To ascertain the facts, I asked one of my associates in civil life, Mr. Fred Melling, Mechanical Engineer, to arrange a private visit of the Vickers Works. During this visit, I asked if I could see the machine gun assembly shops. The engineer in charge of our visit said, "I am sorry but there is nothing to see there. We are polishing up a lot of 80 machine guns ordered by Italy before the declaration of war. We don't quite know if we must deliver them. In any case, they seem to have developed in high quarters some sort of prejudice against machine guns. We have no orders on hand and we feel it is a great pity." We were then at the end of November 1914. I can only suggest that Brutinel may have 'miss-remembered' or the engineer in charge was not telling the truth as at November 1914 Vickers had yet to supply the orders that the British Army had requested in the four contracts made during August and September 1914! If the assembly shops were idle why weren't they producing the Vickers guns already ordered that year? The company were noted for 'failing to keep its promises on delivery' well into 1915. As he appears to have done when it came to the date of the incident - see my post 20. Quite understandable: Brutinel was 80 years old when he recorded his recollections, and he did so some 38 years after the Royal inspections. The Royal occasion of November 4 comprised a series of visits to different camps, including Pond Farm where Brutinel's unit was camped. That of February 4 appears to have been more one of meeting senior officers and then taking the salute at a march-past of the Contingent. My attempts to access the Brigade's war diaries for this period result in the message "Warning: Descriptive record is in process. These materials may not yet be available for consultation". Perhaps the orders were wending their weary way through the hands of War Office "ink-slingers" and arrived at Vickers some time after Brutinel's visit? Anyone who reads Fuller's memoirs will remember the amusing and pathetic saga of the CIGS' dividers and the bureaucratic round-game that prefaced their issue. R.V.K. Applin, who I was just reading the other day, recounts similar nonsense as do the memoirs of innumerable other officers. If questions were raised within the War Office over late deliveries the ink-slingers would be sure to blame the contractor, not their own delay in processing the orders. Indeed, knowing how other contracts were at times "back-dated", I would be sceptical of dates claimed on them particularly on so tendentious a subject as machine guns. Vickers has an extensive archive I believe; perhaps someone should dig into it? The company records are more likely to show what was actually ordered when. "The first comparatively small orders placed with Messrs. Vickers in August and September, 1914, were at prices ranging from £167 to £162 per gun (inclusive of spares). On the larger orders of September, 1914, the firm refused to make any reduction on the ground that the consequent reductions in manufacturing costs were balanced by the need for providing capital for the extensions." All this was before November 1914, it continues: "The price subsequently fixed for the large orders placed by the Ministry in July, 1915, was £125 per gun, a rebate of £25 per gun being made towards the £300,000 advanced by the State towards the new factories." "The immediate shortage was mainly due to the failure of either Messrs. Vickers or the Armes Automatiques Lewis to redeem their promises as to immediate delivery." The number of machine guns ordered was based on the manufacturers stated production capacity. They had the orders they could not deliver on them. According to the Official History of the Ministry of Munitions that is? Written when exactly and by who? Would Vickers or anyone else be likely to promise "immediate delivery" do you think? That hardly seems probable does it as "immediate delivery" could only be made if stock was on hand rather than manufactured to order? Smells more like something else to me. The Official History of the Ministry of Munitions is a twelve volume detailed history of wartime supply of war materials, problems associated with it covering many aspects. It is a core published resource on the matter. As it is so large and covers a wide variety of things it has multiple authors and published mainly between the wars. It is full of data tables, costs and deliveries of items throughout the war. I - Industrial Mobilization 1914-1915. II - General Organization for Munitions Supply. III - Finance and Contracts. IV - The Supply and Control of Labour 1915-1916. V - Wages and Welfare. VI - Manpower and Dilution. VII - The Control of Materials. VIII - Control of Industrial Capacity and Equipment. IX - Review of Munitions Supply. X - The Supply of Munitions. XI - The Supply of Munitions. XII - The Supply of Munitions. I only have copies of the last three volumes, Volume XI has Part V on Machine Guns. You seem to be implying that the information contained in these volumes must be 'suspect', presumably due to it not matching Brutinel's memory of someone else's alleged comment. Do you have any other evidence of "Smells more like something else to me" ? Smells like some retro-active self-justification: having failed to appreciate the value of machine guns before the war, or indeed for some time after, one can well imagine that a few dates might be changed to make things look better. We know what Gen. Edmonds who edited the Official History had to say about its veracity don't we? Would the Ministry of Munitions have been more reliable? That would be stretching the bounds of credulity! I suppose it is possible that Brutinel suffered an aural hallucination, or that he invented the whole thing, but that doesn't seem likely, nor does he seem to have struggled to recall events in the tapes. Worth remembering too that he was "going on the record" in the most definite way by recording a tape; would he have done so if he stood to be flatly contradicted by other records? Could it have been an elaborate deception by the engineer at Vickers? Even less likely isn't it when he's speaking to a senior serving officer no doubt in uniform and better yet, a prospective major customer? No, probably the contracts were just back-dated, or Vickers simply didn't receive them until after Brutinel's visit. So what about the "immediate delivery" conundrum? The Official History of the Ministry of Munitions would have been very poor at being 'retro-active justification' as only about 250 copies of each were originally produced for in-house use (lessons learned for a future war) and were only disposed of to the public in the early 1950s. It is more available now because Naval & Military Press have re-printed it. Also as the formation of the Ministry of Munitions was considered a revolutionary step when undertaken during 1915 they would probably not be concerned at 'covering up' any problems with the earlier War Office orders for machine guns or anything else. I don't think your criticism stacks up. Also Brutinel could not have placed any orders with Vickers in November 1914 as Vickers would have to get permission from the British Government, hence my previous reference to the French order and the government caveat on that. 'Immediate delivery' would be as the guns were produced so batches would leave the factory on a weekly or even daily basis, delivery would not wait until the full order to be produced if that is what you are implying? Vickers was not producing the MGs at the rate they said they would when accepting the orders, many other companies producing other 'munitions' also failed to deliver (eg. shell shortage etc), and as I have looked through MUN documents in the UK National Archives reference other supplies, such as flares, you can see a failure to deliver enough of the orders by the dates required well into 1916 and even later. 1914 Aug-Dec. - Maxim 13, Vickers 266, Lewis 8. 1915 - Maxim 38, Vickers 2,405, Lewis 3,650, Hotchkiss 9. 1916 - 307, 7,429, 21,615, 4,156. 1917 - 308, 21,782, 45,528, 12,128. 1918 - Nil, 39,473, 62,303, 19,088. Totals - 666, 71,355, 133,104, 35,381. Vickers made up 29.7% of total output. We can agree to disagree on the utter veracity of the History of the Ministry of Munitions. The limited distribution would make any assertions very unlikely to be questioned, much less contradicted. The impetus for a cover-up would be considerable, and would extend to high quarters. As for Vickers' contracts and the figures you quote, one can only guess that the contracts were either issued to other companies or back-dated in one way or another. Personally, I don't find it credible to suggest that Brutinel either invented or mis-remembered the incident recounted: the impression it must have made would be considerable and he obviously remembered it in detail - who wouldn' t?! Some people have remarkably good memories for names, dates, places etc. even in old age; it is a noted characteristic of the elderly that they remember distant events better than more recent ones. Most of us do not have such abilities and until one encounters such a person and is impressed by their remarkable memory - if one has the wits to notice - one often tends to assume that average memories are universal, when they are not. However, it should be mentioned that Brutinel appears to have mis-remembered some things, for example his alleged statement, reference MG barrages, that he "...complained that the British 'schools' started to take notice of it only after the famous Vimy Ridge operation in April 1917" is not accurate. The discussion reference this can be found in books such as 'Battle Tactics of the Western Front' by Paddy Griffith, and 'Machine Guns and The Great War' by Paul Cornish, which has examples of various formations using 'Barrages' and proto-barrages' during 1916 (and even 1915). Also on the same day as the Vimy Ridge operation other formations were using MG 'Barrages' during the wider Battle of Arras, including the 9th (Scottish) Division (see 'The History of the Ninth (Scottish) Division 1914-1919' by John Ewing, page 188). More telling is the content of the training pamphlets at the time, used by the units and 'schools' . These include SS 106 'Tactical Employment of Machine Gun and Lewis Gun' of March 1916, SS 122 'Some Notes on Lewis Guns and Machine Guns' of September 1916, and also in Section XVI 'Machine Guns' of SS135 'Instructions for the Training of Divisions for Offensive Action' of December 1916. All of these have reference to what would be classed as 'Barrage' fire. At the time Brutinel would have been aware of these, and probably contributed to them, as would the wider CEF. I can only assume that at a later date when asked he had 'forgotten' about these details, and I don't think the 1916 documents can be regarded as a 'cover-up'! I think we touched on this before: Applin makes mention of going to see Brutinel about barrage methods just after Vimy, reportedly at Gen. Plumer's suggestion. Of course Plumer like others would be quick to conclude that some innovative tactical method might explain the Canadian success at Vimy, rather than a thorough and detailed preparation and training: the implication of course being that the numerous failed attacks and offensives were not due to the poor tactics, organization and preparation. A most attractive conclusion for generals with much blood on their hands. Regardless, to return to Applin if he did not in fact learn anything from Brutinel that he had not already covered in his own research and writing, one would rather expect him to say so, or at least infer it. However he does neither, but frankly states that he put Brutinel's methods into effect. Now it could be that he or others in the M.G.C. had evolved similar methods, but could not get authority to use them, whereas the Canadian success at Vimy and the eagerness of generals to find some exculpatory explanation for it, might have meant that he had an authority to conduct such operations that he could not get before...? Again, despite the modesty of his writing, one would expect some reference to that if it was fact. Brutinel obvioulsy believed he and/or the C.M.G.C. was the originator of the method. Brutinel also mentions being asked by G.H.Q. to "retrain" the M.G.C. and to revise the curriculum and methods of their schools in 1917. One can imagine how delighted G.H.Q. were to rub the noses of the M.G.C. in this sort of way; as much as to say, "You have failed so we are going to get the Canadians to straighten you out." Anyone who thinks G.H.Q. did not have that sort of attitude ought to buy themselves a copy of Baker-Carr's book. "...an important figure in the development of machine-gunnery in the British Army. Unfortunately his book is not entirely trustworthy as an account of events. Not only does the author display a rather relaxed attitude to the recording of dates, but he also appears unaware of developments that occurred in his field of expertise during his eight-year sabbatical from the Army. Furthermore, the whole book is presented as a heroic struggle waged by the author against the dead weight of the 'military mind'. Enriching this heady brew is Baker-Carr's evidently festering resentment of those, unlike himself, attended Staff College. This makes for lively reading, but unreliable history." Baker-Carr does make some good points in his book, however, his 'agenda' causes problems. I can only suggest that you read more widely on the subject, if possible looking at the pamphlets and other documents of the period in question, which will show how machine-gun use and tactics changed without any post-war input. Thanks for your suggestion; if I find memoirs by others who were actually there I will certainly make an effort to read them, as time permits. I flatter myself I've dug up more than the average reader; Applin's memoir for example, and his book on MG tactics... I've had a copy of Baker-Carr for at least ten years now. Easy enough in these times to note significant actors as one reads and then research them online: thus I found Stephen Foot's "Three Lives" via a reference in Fuller's memoir, a book which oddly seems to attract very little interest and has never been republished, despite being one of the most interesting and frank of the genre. I just finished a book by a gentleman who was a curator at a well known arms museum and I am sorry to say it was absolutely laden with factual errors, and there were quite a few blocks of text I recognized from previous publications on the subject. In fairness it is hard to write on a specialized subject unless it has long been a particular interest. That matter I will not go into further however. Baker-Carr, perhaps a bit surprisingly for a former instructor at Hythe, mistakes the Palma Trophy for the King's Prize, but then a war and a good many events had occcured since he was perhaps involved at Bisley as he was a "dug-out" who of course was not considered young enough to die for King and Country in 1914 and had to inveigle himself into the war as a "gentleman chauffeur", until enough of the young were killed that space was made for the older. His reported test of the Ross MkIII was amusing and probably reflected as much of a going-into the matter as GHQ then thought worth their time: two or three duffers with no knowledge of small arms and himself. The defective ammunition is of course ascribed soley to the Americans IIRC! I must say I always find it a rather odd presumption on the part of modern students to think that the attitudes expressed by those who were actually "there" can be dismissed as silly or unwarranted prejudices. I believe Fuller shared Baker-Carr's contempt for the idea the "P.S.C" after one's name granted the holder miraculous powers of military insight and command, as a good many of the claimants seem to have thought. Once the incompetence of the higher levels of the professional army officer corps had been demonstrated by the casualty lists and the flops that caused them, a great many people came to see that for all their vaunted qualifications, most were unable to think innovatively and persisted with true "military mind" as both B-C and Fuller called that bloody-minded persistence in repeating costly mistakes and careless preparation again and again and again, despite the evidence that new methods were needed. Pre-war military life in the UK then attracted a disproportionate share of society's dunderheads for whom a place had to be found. It might work to imply that Baker-Carr simply had a "festering resentment" against the P.S.C. chaps, but Fuller? Probably the greatest mind to ever wear the King's Uniform? Yes, I know it's now fashionable to pretend that those who were there and often knew the principals personally, or knew those who did, got it all wrong. Haig & Co. are enjoying with few exceptions a regular summertime of revisionism; mostly a product of an aging population IMHO. Baker-Carr does indeed write in a somewhat ironic tone; highly restrained I would have called it considering what he witnessed and how many died or were ruined as a result, and what hung in the balance. The fact that B-C doesn't mention anything about for example Col. Applin or the Russo-Japanese War etc. seems to me more likely due to either his making no pretence of having kept himself au courant with MGs after leaving the Army, or more likely if he left in 1907 as I seem recall, he simply was never that well informed about them before arriving in France and made no pretence of having been. Recall also that he ran into some financial difficulties due to IIRC a divorce and perhaps the Crash of '29. The book then was quite likely an attempt to write something readable that would sell, rather than a serious study of the whole matter. Of course it could be that Baker-Carr was somewhat ahead of his time in "self-assertion" as I believe what was then termed "self-advertisment' is currently termed. He might have omitted mention of previous MG developments at least in part to make his own contribution seem larger. One needs to read repeatedly and with care to get a proper sense I suggest. It is worth remembering too that when a person has been a witness to events and actions that seem at best folly and at worst criminal insanity, to remain of sound mind and in reasonable equanimity requires a certain distancing, a certain way of relating to those events. Some preferred to remember only the good, the cheerful, others - the majority perhaps - tried to push it all out of their day to day consciousness. Others tried to see it all with a sort of bemused and distant (where possible) irony; I suggest that B-C was one of the latter. If that is an "agenda" he is welcome to it and to describe it as such to me suggests a rather odd lack of human perception. Personally though, I am quite confident that Baker-Carr's proposal did indeed end up in the "NFI" bin at GHQ and that Fuller is correct in his perception of the attitude of GHQ to tanks, and if I needed further evidence, there are statements like the idiotic remark by Rawlinson to Wilson in late 1918 that tanks and aviation were a waste of manpower and what was needed was more infantry (bayonets). Bayonets are a much under-rated weapon, but it takes a man of a certain calibre and skill to make good use of one. Rawly and his ilk had killed most of those men by 1918. What was needed was the machines that could multiply the power of those that remained so as to best fill the gaps left by those missing hundreds of thousands. Those not overly afflicted with "military mind" were able to see that and quite early in the war. Baker-Carr was certainly one of those and it is a sad testimony indeed that they were so much in the minority and had to struggle so long and so hard against opposition in high places that seems to have ended sometime after WWII. Opposition that cannot even be called the Bourbons of military thought as they indeed forgot much!